Josh Daniels following his spectacular goal for Glenavon in the 3-1 victory over Ards. Pic by INPHO. It was a case for the defence from both managers in the aftermath of what proved a free-flowing, four-goal fixture that left Glenavon back on track and Ards still rooted to the bottom of the table. Andrew Mitchell, Josh Daniels and Sammy Clingan rewarded Glenavon for a return to the high-tempo football which has left Gary Hamilton’s side at the high end of the Danske Bank Premiership. 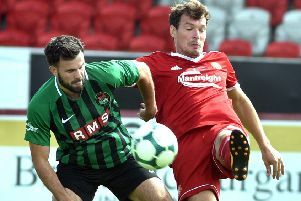 Substitute Michael McLellan made his mark for struggling Ards but both managers took time out of the post-match review to reflect on backline affairs. “Dylan King is young, has played a lot of games recently and sometimes with the odd natural dip it is good to take them out, allow time and then come back in and do well,” said Hamilton explaining a defensive reshuffle which led to James Singleton replacing King at centre-back and Ben Doherty playing left-back. “Dylan has been brilliant for us since coming here but he is young and for centre-backs when they make mistakes they usually end up in the back of the net. “We’ve two young centre-backs in Dylan and Caolan Marron, which is unusual in the game given it’s such a difficult position. “Caolan has had the benefit of a few seasons here so is a little ahead at the minute but Dylan is someone we’ve high hopes for as he’s strong in the area, has a great diagonal ball and is physical. Ards boss Colin Nixon had his week-long preparations ripped apart by injury woes before kick-off and early in the first half that cost the manager, respectively, David Elebert and Johnny Taylor. “We had a centre-half injured in the warm-up, then another injured 10 minutes in, plus a winger injured that forced us into making a sub at half-time,” said Nixon. “That left us very limited in terms of what we could do in the second half, plus changes everything you’ve worked on during the week. “When you lose your two centre-backs it’s going to be tough and I honestly do not think the luck we’ve had can continue, the injury situation is disastrous. “We reacted well to conceding the first goal and had a few chances then missed a great one in the second half. “Then you are 2-0 down, chasing the game but, again, credit to the boys as they dug in and scored plus could have had more. Hamilton was delighted with the three points that secured his side a first league win across November. “We were back to playing with high energy, pressing the ball, creating chances and getting into dangerous areas,” he said. “We didn’t work the goalkeeper enough in the past few games and were found out defensively at times. “Today we gave them a few free headers from set-plays but, on the whole, defended well in open play. “Sammy Clingan came back in and scored a goal that is a great example to any young players watching as when the ball broke back to him he passed it home, that’s the experience.